Drink a Cup of (Fake) Blood! 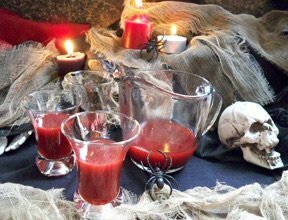 Listen to everyone squeal when you offer them a cup of blood at your Halloween party; then listen to them squeal with delight once they taste it! This Halloween party beverage isn't what it appears to be. Add this recipe to your beverage choices as a fun Halloween party favorite. Watch this video to see how easy it is to carve a pumpkin in any design when you have the right tools. See this collection of interesting Halloween party ideas that are sure create the spirit of Halloween!